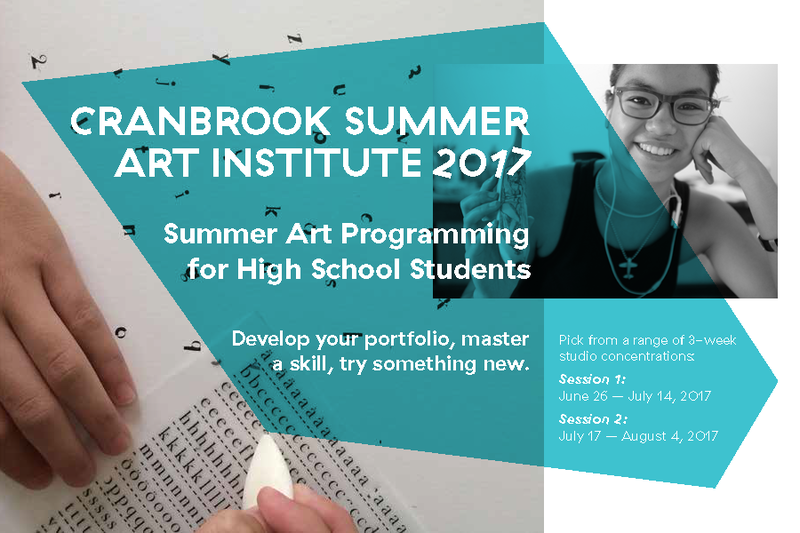 Cranbrook Summer Art Institute providedes studio-intensive fine arts programming for high school students from around the world. Our programs are designed to both bolster creativity and develop fundamental skills through individual attention and innovative instruction. Students can register for one studio concentration per three-week session, Boarding and Commuter options both available. Pick a studio concentration, and develop your portfolio through skill-building workshops with admissions counselors and professionals! Architecture - Learn fundamental concepts of architecture observing structures on campus designed by world?renowned architects, including Eliel & Eero Saarinen, Albert Kahn, Tod Williams & Billie Tsien. (23) Ceramics - Create functional and sculptural ceramic art, focusing on a mix of production methods and techniques. Explore cultural influences and contemporary ceramic arts in the Museum’s collection. Contemporary Photography - Explore and experiment with the technical aspects of digital photography. Learn to think critically, discussing artists working in contemporary concepts and issues. 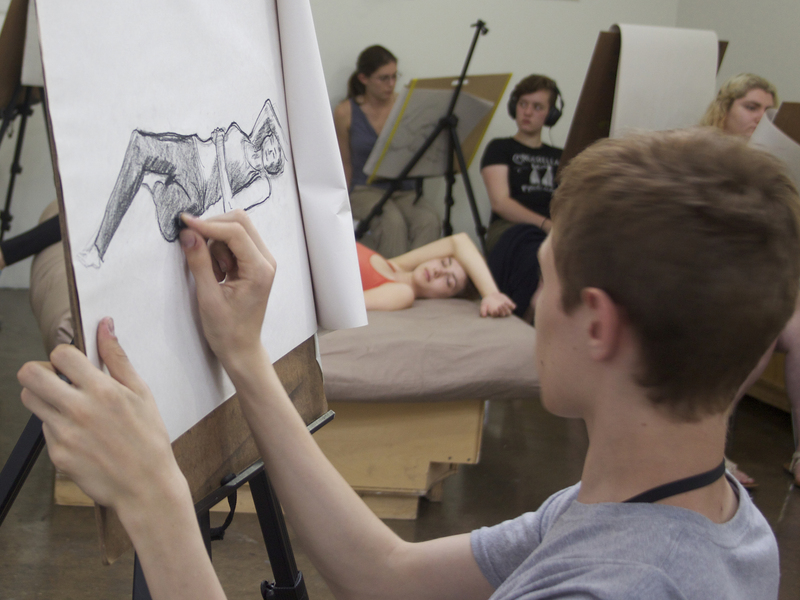 Figure Drawing I - Hone your artistic practice in pencil and charcoal. Working from live models, learn to realistically render the human form from observation, focusing on accurate use of line and tone. Painting I - Strengthen your foundational skills of paint application, composition and color theory en plein air using water-based (ink, watercolor, mixed media) paints on Cranbrook’s scenic 319-acres. 2D Design - Develop your own design vocabulary -- exploring contemporary issues, visual communication techniques, and elements of design -- through a mix of hands-on exercises and projects. Fibers - An introduction to materials and processes within the practice of fibers arts within a historical and contemporary art context. Learn a range of textile construction and adornment techniques. Figure Drawing II - Develop your own creative style, drawing from direct observation, memory and imagination. Create unique figure-based compositions and study conceptual figure work to acquire a visual vocabulary in abstraction. Painting II - Learn paint application techniques in oils and acrylic -- underpainting, glazing, dry brushing, impasto. Work from still life, interiors, and landscapes to develop balanced compositions. Sculpture - Study sculptural techniques and construction methods using paper, metal, plaster, wood and wire, as well as found objects and assemblage. Examine works on campus and analyze modern sculptural practice. Check our website, CranbrookSummerArt.org, for full class descriptions and easy online registration. Portfolio Development: All students have the opportunity to participate in college prep and portfolio development workshops. These skill-building sets include writing artists statements, how to photograph your artwork, developing an artist portfolio online, and meeting with admissions staff from various undergraduate art schools. Afternoon Workshops: Boarding students participate in art-focused workshops 3 days a week. These 2-hour classes expose students to new and different art-making activities, as well as academically focused topics, such as history of art, architecture, and design. Past workshops have included: concrete casting, experimental film, printmaking, bookbinding, weaving, and tie-dye! Evening Activities: After dinner, Boarding Staff coordinate evening activities. These include outdoor games using campus amenities (playing fields and campus trails), team building projects, or visits to the Art Museum, Institute of Science, the planetarium. Past activities have included scavenger hunts, movie nights, extended studio / lab time. Spend three weeks at Cranbrook, a National Historic Landmark in the Detroit suburb of Bloomfield Hills, Michigan; home to picturesque grounds, sculpture, and world-renowned architecture. All meals and snacks are included in Boarding tuition, lunch is included in Commuter tuition. Mon-Fri students eat together in the Dining Hall, which is able to accommodate a range of dietary needs. Meal schedules can be found on the school’s online calendar app. On weekends, the group stops at a local farmer's market and hosts an evening cookout, or takeout is ordered from a local restaurant. CranbrookSAI Boarding Students stay in the Cranbrook Academy of Art Graduate Dorms on campus, which are accessible with a student swipe card. Each dorm offers double occupancy housing, with lounge space on each floor. CSAI staff members live on each residence floor. Saturdays are spent off-campus. Students and staff travel to a variety of locations in Southeast Michigan exploring neighborhoods and cultural institutions in Detroit, Ann Arbor, or Flint. CranbrookSAI uses campus amenities at the Academy and Art Museum, making use of all that Cranbrook has to offer! Educators design classroom projects around the Art Museum’s current exhibitions and collections. Each class visits the museum several times a week for direct observation of tangible, physical resources. Vault visits by museum curators facilitate discussion about art objects pulled from the collection for each class. Classes take place in historic studios at the Cranbrook Academy of Art. Spaces are a mix of individual studios and shared spaces, perfect for individual work time and collaborative group projects. Classes are structured to allow solo time and shared instruction, with peer-to-peer critique. Students are actively engaged in the contemporary art world. CranbrookSAI students learn from young artists in the midst of their graduate career; connecting to studio-based academy learning concepts, with focuses which mirror the 10 departments at the Cranbrook Academy of Art. 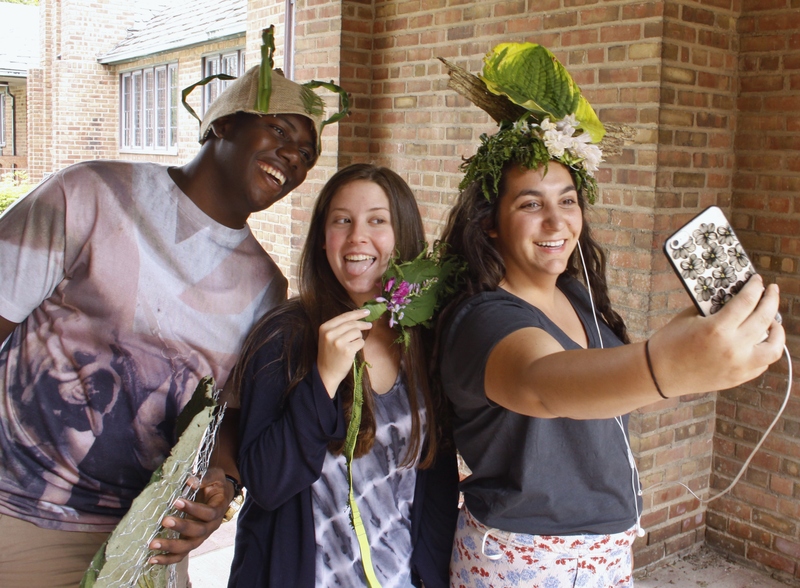 Want More Information about Cranbrook Summer Art Institute? Your request will be sent directly to Cranbrook Art Museum. By submitting this form I confirm that I am at least 13 years of age and give my consent to be contacted by Cranbrook Art Museum by email as well as by phone and/or mail (if provided).